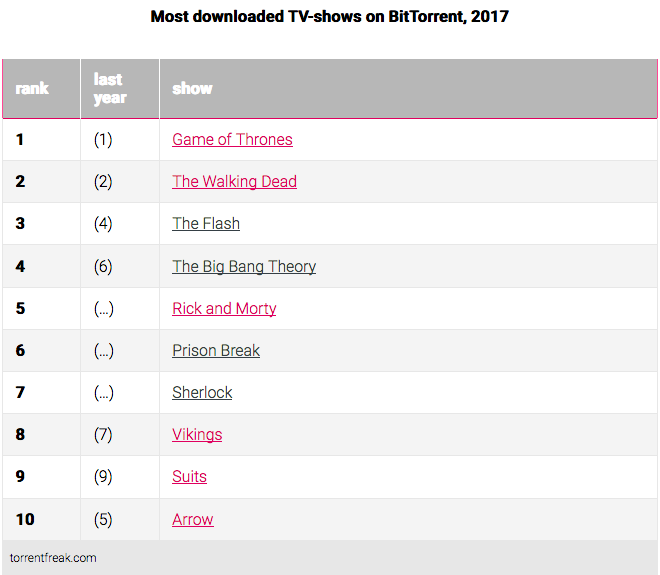 Game of Thrones remains the most pirated TV show, according to file-sharing blog TorrentFreak. HBO’s flagship drama has been at the helm for six years running, once again pipping AMC’s The Walking Dead. Adult Swim animated comedy Rick and Morty was the biggest new arrival in TorrentFreak’s annual top ten, coming in at fifth. The data showed the highest number of people actively sharing a Game of Thrones episode was 400,000, a spike that occurred right after the season seven finale in November.